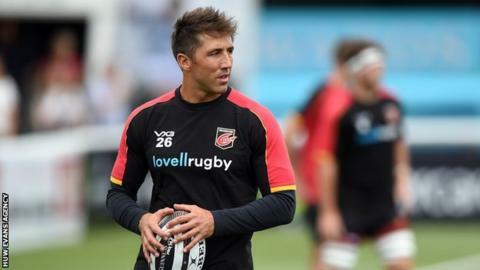 Dragons say it is unlikely former Wales back Gavin Henson will be offered a new contract as they consider a move for Ospreys fly-half Sam Davies. Henson, 37, is out of contract this summer when Davies' deal with Ospreys also comes to an end. When asked whether Henson would be offered a new deal, Dragons interim head coach Ceri Jones said: "Not by the looks of things." He added Davies was the kind of quality player Dragons are seeking. Henson joined the Dragons in the summer of 2017. He signed on a two-year deal from Bristol after playing spells at Ospreys, Saracens, Toulon, Cardiff Blues, London Welsh, Bristol and Bath. The 2005 British and Irish Lions tourist made 15 appearances in his first season, but has only featured three times this campaign after suffering a knee injury and has since found himself out of favour. "He is not selected for this trip (to face Cheetahs and Southern Kings in South Africa), we just feel we have got better options within the squad," said Jones, who admitted he did not know about Henson's future plans. Ospreys fly-half Davies is out of contract at the end of the season and Jones says they could be interested in signing the Wales number 10. "We are in the market for quality players and still looking at bringing a couple of people in," said Jones. "Sam could be potentially one of them but we need to have a good look at it. Sam is an Ospreys player so we will have to see what comes of that." Dragons have been handed a fitness boost with the return of prop Ryan Bevington who has not played since suffering concussion in the victory over Ospreys in December 2018. The former Wales prop has now been named in a 29-man tour party to face Southern Kings on April 7 and Toyota Cheetahs six days later. Flanker James Benjamin, prop Nicky Thomas and centre Tyler Morgan will miss the tour to continue rehab in Wales alongside Cory Hill, Aaron Jarvis, Brandon Nansen, Ollie Griffiths, Nic Cudd, Arwel Robson, Ashton Hewitt, Harrison Keddie and James Sheekey. Jones also said a long-term decision over his own future as head coach would be made later this month once Dragons had returned from South Africa and before the Judgement Day match against Scarlets on 27 April. The former Harlequins prop was announced in January 2019 as the interim head coach after Bernard Jackman was sacked in December 2018. Dragons squad to face Southern Kings and Toyota Cheetahs: Brok Harris, Ryan Bevington, Leon Brown, Lloyd Fairbrother, Josh Reynolds, Rhys Lawrence, Elliot Dee, Richard Hibbard, Lewis Evans, Matthew Screech, Huw Taylor, Max Williams, Lennon Greggains, Aaron Wainwright, Taine Basham, Ross Moriarty, Tavis Knoyle, Rhodri Davies, Rhodri Williams, Jason Tovey, Josh Lewis, Jared Rosser, Hallam Amos, Jarryd Sage, Adam Warren, Jack Dixon, Will Talbot-Davies, Zane Kirchner, Jordan Williams.